Electronic Siren KS-79B combines compactness with functionality. Special design allows for generating loud sound while maintaining a small design. U-shaped stand allows for directional sound maneuvering. 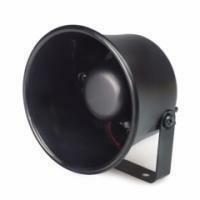 Horn-shaped construction makes this siren suitable for directing concentrated sound at a desired area. U-shaped stand for fixing onto objects/surface and direct sound in the direction.